Well, it’s been a House of Viruses the last 10 days or so. First, I caught a nasty cold, then the baby caught a different virus – the first time he’s had a bad one and it was rough! How do I know it was a different one? Because I then caught that one too, so I was laid out again. Winter huh? Anyway, I have a few posts to catch up on, so without any further ado, some more great things from Etsy, right in time for Christmas! Yay! 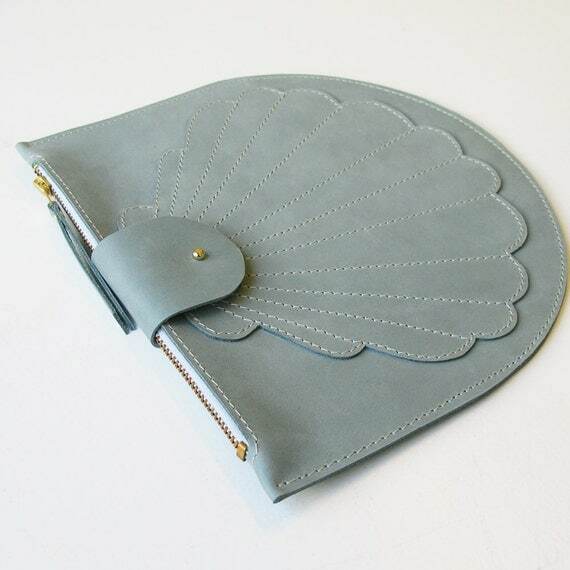 First, a beautiful and ladylike Scallop Clutch Blue from LaLisette. Not only do I love the duck egg blue/grey colour, but I really like the slimness of the bag. It’s very chic. She has lots of other lovely little bags in her shop, with a range of designs. Next, well, okay – hands up, I would never actually wear this Long Fauxfur Winter Coat from NATIPUREIDEA. I absolutely have neither the physique, the attitude, nor the money, if I’m honest. But something about the colour and fabric/texture mix really appealed to me. I know that if I saw someone wearing this on the street I would think “Wow! Amazing!” and it would brighten my day. That’s reason enough in itself to put it here I think. 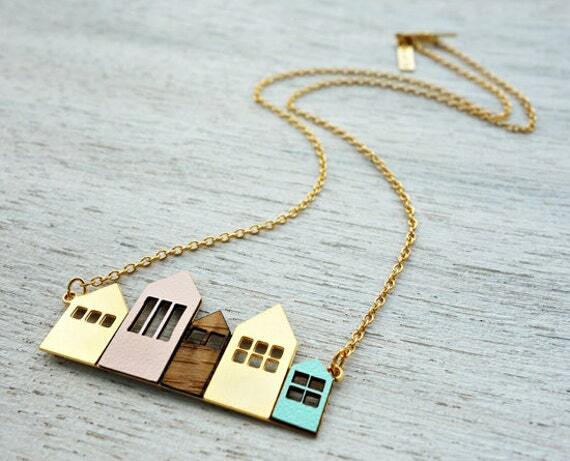 This Short Copenhagen House Necklace is perhaps slightly more within my budget and I really like the simplicity of the houses. I also really, really like the length, which is short. One of the styling photos shows a model wearing it just under a shirt collar and I think it looks great. You can order the necklace with a range of house colour options from shlomitofir, too. Men are totally hard to buy presents for. This will come as no surprise to anyone who knows a man. Like, everybody. 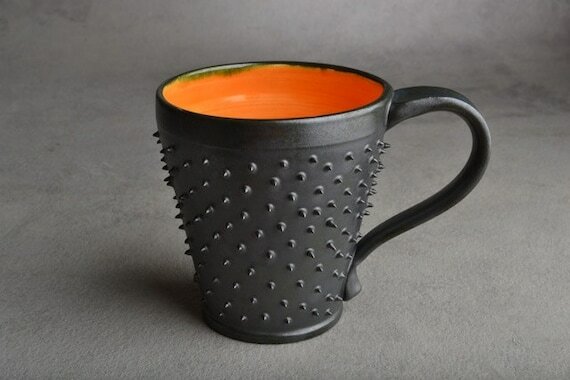 I saw this Spiky Coffee Mug from symmetricalpottery and thought “Instant Man Present Win!”. It’s spiky, in a manly hue, and it doesn’t cost the earth, unlike the technological gadgets that many a masculine chap pines for. 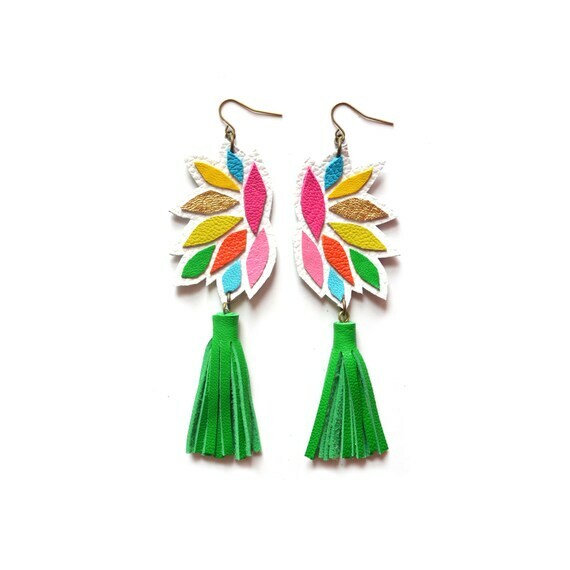 And to end, a pair of bright and crazy Green Tassel Earrings from BooandBooFactory. This shop has all sorts of super-colourful leather jewellery and bags to offer. Some of them would be perfect for a teenager, but there are also many items that could be paired with something more sober and would look great on anyone – they have a real indie/boho vibe to them. Or you could just go all out and hit the street in a riot of colour. Either way, these are really individual pieces from an interesting shop. Okay dokey, back to finishing off some of the work I’ve missed and posting some more makes! Bye for now! ← Monday morning montage – Cyber Monday!